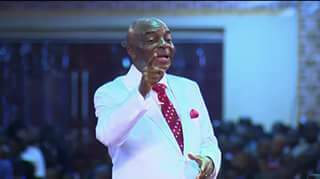 "If you heard or saw anything in the newspapers or anywhere that the G.O has retired, it's a lie of the devil. In our spiritual family tree we don't retire. Someone asked Kenneth Copeland " are you stepping down", he replied, 'no I'm stepping up'. Copeland ministered for 6 hrs straight at 80 yrs of age." Men and brethren settle down and enjoy my being here. I'm going to be here for a very long time. I spoke to my father in the Lord ( Pastor Adeboye ) in person and he said let them enjoy the confusion for a moment'. I believe in the covenant of 120yrs. I can preach for 10 services now and that proves I have many more years before I go. If you hear anything, it's illegal and not passed into law. I'm not serving or earning anything from any body or government. No government can determine the constitution of the church and they know. I was called by God into the prophetic in 1981 and the apostolic ministry in 1992. No authority or law can frustrate an apostolic calling if it's from God. Forget my height oo. All the demons in Nigeria know who's who. Just relax."